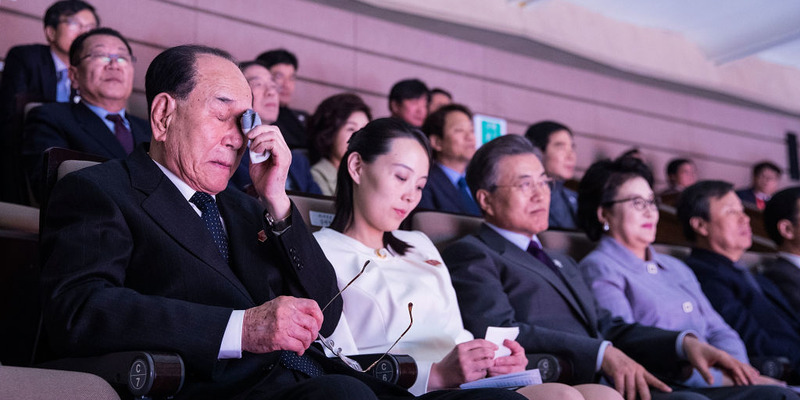 South Korean Presidential Blue House via Getty ImagesNorth Korea’s nominal head of state Kim Yong-Nam (L), with Kim Yo-Jong, North Korean leader Kim Jong-Un’s sister and South Koran President Moon Jae-In at National Theatre on February 11, 2018 in Seoul, South Korea. Kim Jong Un invited South Korea’s President Moon Jae-in to visit Pyongyang, but Moon gave a non-committal response. Moon’s lack of enthusiasm meant the offer was not publicized by state-run media in North Korea. However, by sending Kim’s sister North Korea indicated its seriousness in hosting an Inter-Korean summitt which Moon is still likely to accept. As North Korea’s delegation to the Winter Olympics returned over the weekend, the country seemed to completely ignore an invitation Kim Jong Un had extended to South Korea’s President Moon Jae In. Sunday’s frontpage of Rodong Sinmun, the official newspaper of Korea’s ruling party, prominently featured a meeting between Moon and Kim’s sister, Kim Yo Jong, but made no mention of the invitation. “Invitations extended by the Supreme Leader are not supposed to be declined, and President Moon Jae In was rather non-committal about his intentions to meet with Kim Jong Un “when the right conditions exist,” Leonid Petrov, a Korean studies expert at the Australian National University, told Business Insider. Despite Moon’s slightly elusive response, Petrov believes North Koreans would have been excited about the first step towards a new Inter-Korean summit that could open dialogue about potential peace on the Korean peninsula. There’s also history and expense to contend with – before the last two Inter-Korean summits, in 2000 and 2007, the summit was conditional on South Korea giving North Korea large sums of money. “In East Asia serious business is traditionally done only through personal contacts, where trust-building process may take time before the parties feel 100% confident to open their cards and team-up to achieve the greater common goal,” Petrov said. “It was expected from the outset that by sending the highest possible level of negotiators – the nominal President and the potential heiress to the regime – across the front-line, the North Korean leader was serious about resuming the dialogue with the South,” he added.